We are delighted to receive the SDM15 Best Research Paper Honorable Mention award. The Society for Industrial and Applied Math (SIAM) International Conference on Data Mining (SDM15) Awards Committee selected 4 papers for awards from nearly 400 submissions. Petitjean, F., & Webb, G. I. (2015). Scaling log-linear analysis to datasets with thousands of variables. Proceedings of the 2015 SIAM International Conference on Data Mining, pp. 469-477. 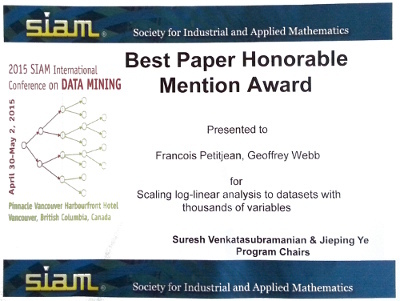 The post SDM15 paper award appeared first on Geoff Webb.